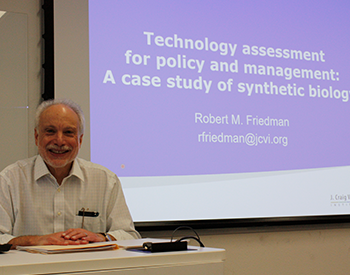 Robert M. Friedman knows a thing or two about the environment and policy. Before joining the J. Craig Venter Institute (JCVI), he was a senior associate at the U.S. Congress Office of Technology Assessment. For 16 years, he advised Congressional committees on issues involving environmental and natural resources policy. Currently at JCVI, he is vice president for Policy and University Relations, directs the Policy Center and is active in several ongoing projects in their Environmental Genomics Group. Enter Professor of Practice Friedman’s class at the UC San Diego School of Global Policy and Strategy (GPS) and you are welcomed with a smile and a sincere passion for all things science and policy. Open to all GPS students, alumni and those interested in bioengineering, the certificate course is divided into five sessions including an overview of synthetic biology, dual use concerns, environmental and human health concerns, international governance of synthetic biology and using “gene drives” to rewrite the genetic code of mosquitos. "Friedman bridges the disciplines, offering students an opportunity to work with a top practitioner in the field of STEM and policy," said GPS Dean Peter Cowhey. "We were thrilled to invite Friedman to GPS, as part of our effort to offer more professional development resources for our students in current, cutting-edge issues." 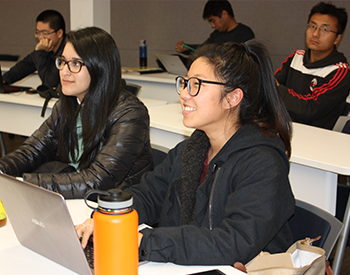 Hoping to close the gap between physical and social sciences across campus, the course was opened to STEM students across UC San Diego, particularly bioengineering and biology Ph.D. candidates and postdoctoral scholars, to provide for richer discussion. For Eunji Kim, 2019 Master of Public Policy candidate, she hopes to work in an organization that looks at biotechnology through a public policy lens and helps to develop efficient and impactful collaborative measures between government and science sectors. Looking at issues of regulations in the 21st century, the course highlights readings and studies on governance and regulation as well as concerns and controversies over DNA synthesis and biosecurity. Friedman highlights that the case for synthetic biology is truly at the intersection of STEM and policy. Because of rapid advancement, new technologies are having to be governed and managed daily, from biotechnology to science for environmental policy. Alumna Darcy Cook ’91, who focused on environmental policy while at GPS, couldn’t agree more. Having followed the Venter Institute and its work on synthetic biology from its inception, she jumped at the opportunity to participate in the certificate program. In the last class, Friedman cites UC San Diego’s Tata Institute for Genetics and Society, which is working to engineer mosquitos to combat malaria and other insect-borne disease, rewriting genetic code and the rules of inheritance in this 21st century biotechnology.